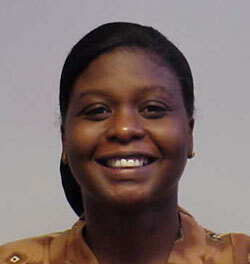 I am Deidre Williams Evans, Associate Professor in the Department of Computer and Information Sciences. I received my Ph.D. in Electrical and Computer Engineering from Georgia Institute of Technology, Atlanta, GA in 1994. I also possess a M.S.E.E. and B.E.E. from Georgia Institute of Technology, Atlanta, GA and a B.S. in Computer Science from Spelman College, Atlanta, GA. I joined the Department of Computer and Information Sciences as an Assistant Professor in 1994 and have been tenured and promoted to Associate Professor since then. During this period, I have participated and obtained grants as CO-PI totaling over $3 million. I am currently directing a master's student and have served as a committee member on several other students' thesis committees. I have published and presented in regional and international conferences. My research interests include cryptography, data compression, and formal specifications. I have taught a variety of courses in the areas of discrete structures, programming, and formal methods. I have also served on a variety of departmental and university level committees. Stoecklin, Sara, Williams, Deidre, "Modeling a Professional Liability Claims Handling System Using UML", Journal of Conceptual Modeling, Volume Number 13, April 2000. Balaram, M., Guha, R., Velamupati, U., Williams, D., "Intelligent Control in Data Distribution on Simulation Methods and Application, Orlando, Florida, November 1-3, 1998, pp227-230. Stoecklin, S., Williams, D., Stoecklin, P., "Tailoring the Process Model for Maintenance and Reengineering", IEEE Second Euro Conference on Software Maintenance and Reengineering, Florence, Italy, March 1998, pp209-212.